Not every defensive situation justifies the use of a firearm. Yet, too few people give consideration to having some sort of less-than-lethal defensive tool on their person. You might come under attack by a person who clearly is not armed with any deadly weapon yet is big and stout enough that you stand a good chance of being hurt. You might come under attack by a dog that is big enough to hurt you, but not big enough to cause death or serious bodily injury. In both cases, using your hands and feet to defend yourself might not be the best idea. A canister of pepper spray for personal defense might be a handy thing to have in those kinds of situations. Pepper spray is a chemical that causes severe irritation to the eyes and nasal passages of humans and animals. It is certainly a step up from the old chemical Mace that we used to use when I was in law enforcement, but it works on a similar principle. When properly used, it will certainly stop an attack. I still remember the time that I got inadvertently sprayed with Mace during an arrest that had turned into a donnybrook. Having been hosed down with that less-potent chemical Mace, I don’t ever want to experience pepper spray in that manner. As with any defensive tool, don’t go the cheap route when buying pepper spray for personal defense. Do your research ahead of time and buy the best quality product that you can find. Check with local law enforcement to find out what brand they are issued and/or prefer. When you make your purchase, it is a good idea to buy two canisters. Use one of the canisters for practice only. Alternately, inert canisters such as those available from Sabre can be used for training. It is important to know how to operate it quickly. It is even more important to find out exactly from how many feet away you can still hit an attacker’s face. With practice, you will also be able to discover just how quickly you can draw the pepper spray canister from wherever you choose carry it and engage a target. Like anything else, when someone, or something, is after you is not the time to start fumbling with unfamiliar gear. 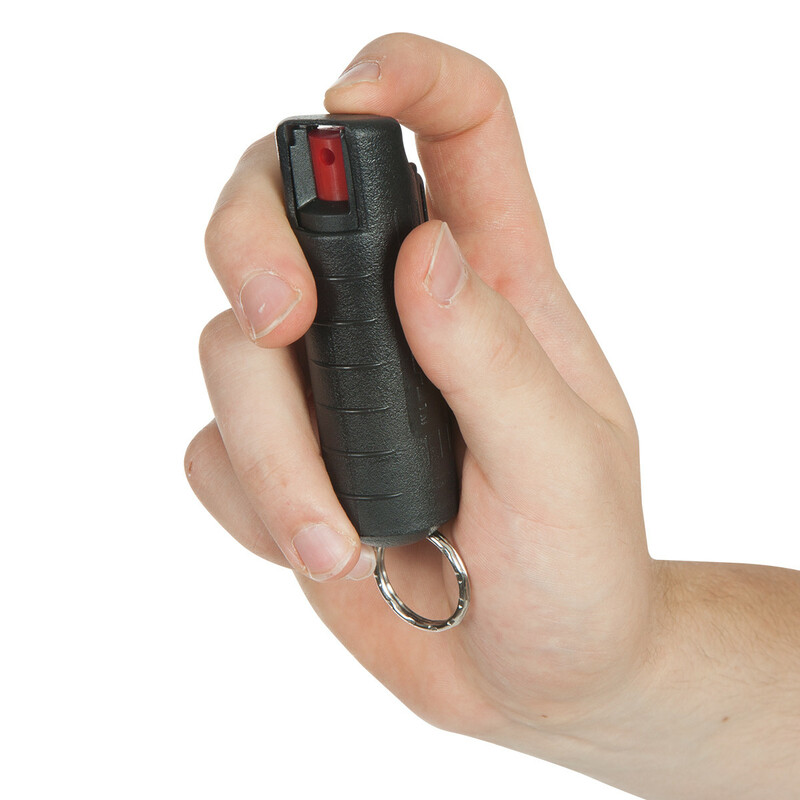 Like any other defensive tool, using pepper spray for personal defense is not infallible. It may not work well on certain people due to their physical makeup or the various substances that they might have ingested. It also will not work as advertised if a strong wind is blowing towards you. I don’t recommend pepper spray for bear attacks. In an attack, a bear can cover a lot of ground very quickly, and it is highly unlikely that a person will have time to transition to a firearm, should that be needed. One should also be conscious of the expiration date on the pepper spray canister. It would be a good idea to replace the canister well before that date. To err on the side of caution is usually not an error. No defensive tool, including less-than-lethal devices, will solve all of the problems that might arise. However, carrying pepper spray and knowing how to use it effectively will expand a person’s ability to protect himself and to do so in a lawful manner. Note that some states and localities have specific legal guidelines regarding the carry and use of pepper spray. Be sure you check and follow all laws before using pepper spray for personal defense. This post appeared originally on Shooting Illustrated. This entry was posted in Peace Officers, Personal Defense, Training and tagged mace, sabre. Bookmark the permalink. But as Sheriff Wilson says, Even Pepper spray may not work on some people (think PCP or bath salts). You must be ready to quickly use an alternative. Especially if there is a disparity of force. I do agree that it would be wise to always have some pepper spray with you when going out even if you already know some self-defense techniques. That is why I always have my daughter bring around one for her safety in addition to her concealed pistol. I’ll probably enroll her in some self-defense training too and have some apps that could teach her self-defense installed on her phone. That way we both can be reassured that she’ll potentially be safe in many circumstances. Thanks!